CNC machining can produce parts with tight tolerances (up to ± 0.025 mm) and fine detail from a variety of metal or plastic materials. Due to the subtractive nature of CNC, minor tool marks will be visible on the surface of the part after machining. 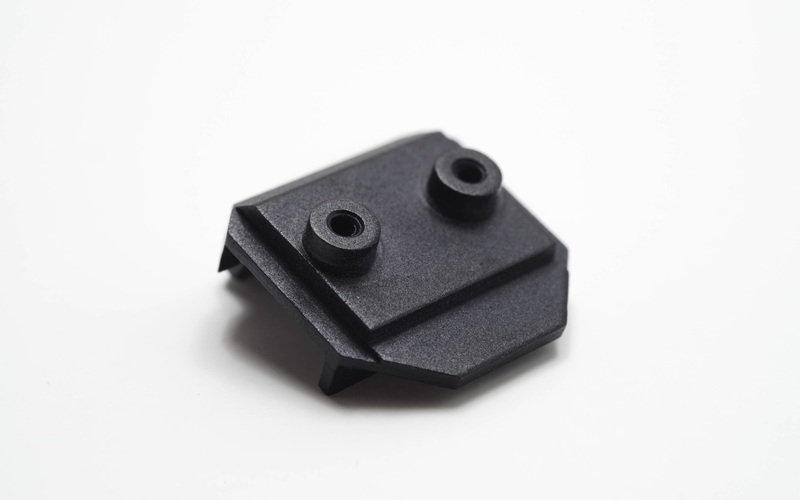 A number of post-processing and finishing methods can be applied to improve the surface roughness, visual properties and wear resistance of the CNC machined parts. 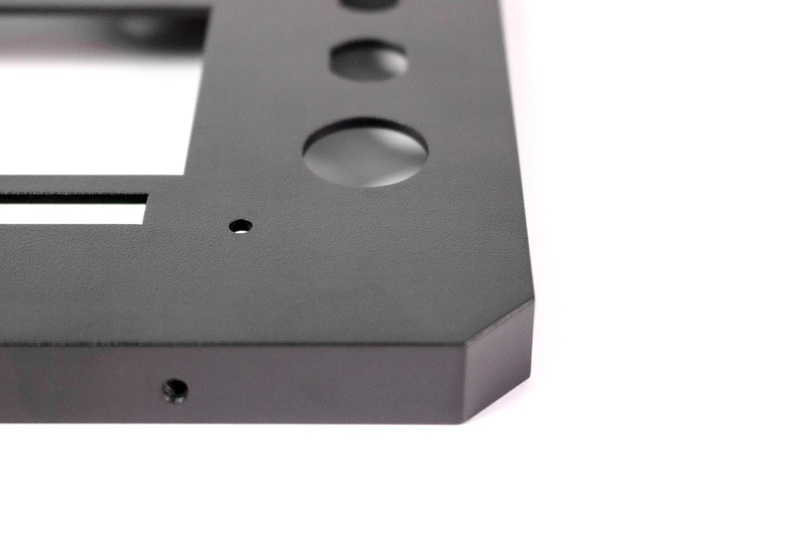 In this article we discuss the most common metal CNC finishes to help you select the most suitable surface finish for your application. As Machined parts have minor visible tool marks. The standard as machined surface roughness (Ra) is 3.2 μm. Surface finish requirements can be increased to 1.6, 0.8 and 0.4 μm. Bead blasted parts have a matte finish with a light texture. Mainly for visual purposes. Anodizing (Type II) adds a corrosion resistant, ceramic layer to the surface of the part. Can be dyed to different colors. Available only for Aluminum and Titanium. Anodizing (Type III) adds a wear and corrosion resistant ceramic layer to the surface of the part. Offers greater protection than Type II. Can be dyed to different colors. Powder coating adds a wear and corrosion finish to the surface of the parts. Has higher impact resistance compared to anodizing. Large range of colors available. Can be applied to any metal. 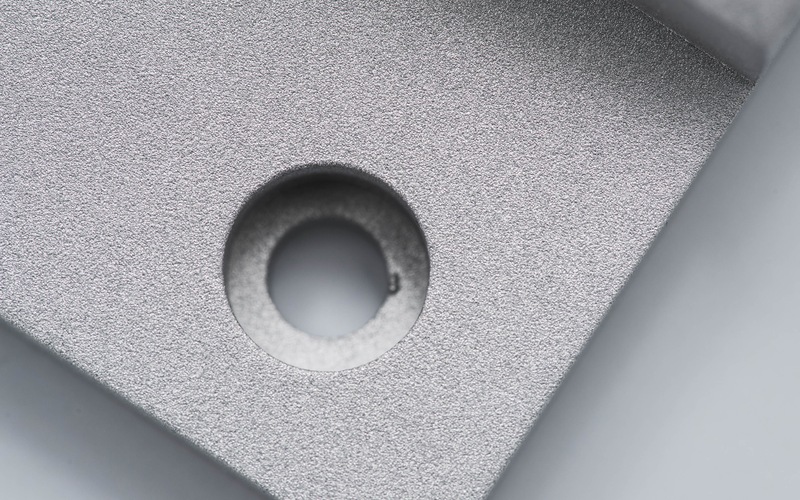 Technical overview: Explore the full list of finishes available on 3D Hubs. Get your metal and plastic parts CNC machined and finished in as fast as 5 days. As Machined parts will have marks that follow the path of the cutting tool. The quality of the surface is measured in terms of average surface roughness (Ra). Ra is a measure of the average deviation of the machined profile from the ideal surface. 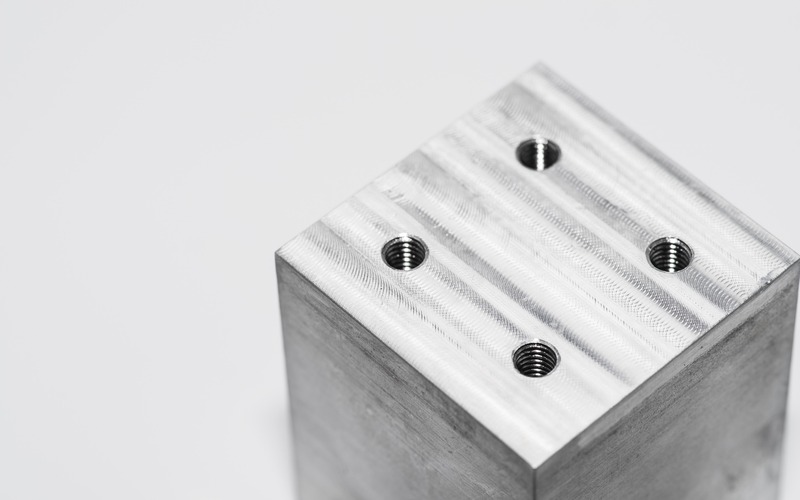 The standard as-machined surface roughness is 3.2 μm (125 μin). A finishing cutting pass can be applied to reduce the roughness of a surface down to 1.6, 0.8 or 0.4 μm (63, 32 or 16 μin). This will increase the cost of producing a part, as extra machining steps and tighter quality control are required. As machined parts can be also smoothed or polished to improve their surface quality and aesthetics by reducing their surface roughness. Smoothing and polishing will remove some material affecting the dimensional tolerances of the part. Bead blasting adds a uniform matte or satin surface finish on a machined part, removing the tool marks. In bead blasting, the part is bombarded with small glass beads using a pressurized air gun, removing some material and smoothing the surface. Critical surfaces or features (like holes) can be masked to avoid any dimensional change. Bead blasting is used mainly for visual purposes. It is a manual process, so the result will depend to some extent on the skill of the operator. The size of the air pressure and the size of the glass beads are the main process parameters. Glass beads come in different sizes (from courser to very fine) just like sandpaper comes in different sizes and grades. Anodizing adds a thin ceramic layer on the surface of metal parts that protects them from corrosion and wear. The anodic coating is electrically non-conductive, has high hardness and can be dyed to different colors. Anodizing is only compatible with Aluminum and Titanium. In type II & type III anodizing the part is submerged in a diluted sulfuric acid solution and an electric voltage is applied between the component and the cathode. An electrochemical reaction consumes the material on all exposed surface of the part and converts it into hard aluminum or titanium oxide. A mask can be applied to the surfaces with critical dimensions (like threaded holes) or the surfaces that must remain electrically conductive to prevent them from anodizing. 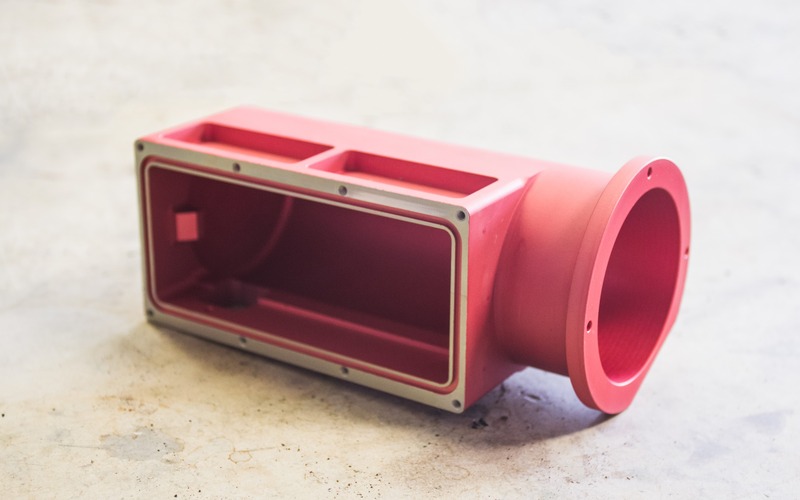 The anodized parts can also be dyed in various colors before sealing (such as red, blue, black or gold), which gives them an aesthetically pleasing surface finish. Anodizing Type II is also called "standard" or "decorative" anodizing and can produce coatings with thickness of up to 25 μm. The typical coating thickness depends on the color and can vary between 8-12 μm for parts dyed black and 4-8 μm for clear (un-dyed) parts. Type II anodizing is mainly used to produce parts with a smooth, aesthetically pleasing surface and provides good corrosion and limited wear resistance. Anodizing Type III is also called "hardcoat" anodizing and can produce coatings up to 125 μm thick. If not otherwise specified, the typical type III anodic coating is 50 μm thick. Type III anodizing produces thick, ceramic coatings with high density that provide excellent corrosion and wear resistance, suitable for functional applications. It requires though closer process control compared to type II anodizing (higher current density and constant solution temperature near 0oC), so the cost is higher. The anodic coating grows in both directions equally. This means that a 50 μm thick coating will protrude approximately 25 μm above the original surface and that a cylinder with 1 mm diameter before anodizing, will have a diameter of 1.05 mm after anodizing. More details on anodizing can be found in the MIL-A-8625 standard. Powder coating adds a thin layer of protective polymer on the surface of the part. Powder coating is a strong, wear-resistant finish that is compatible with all metal materials and can be combined with a bead blasting to create parts with smooth and uniform surfaces and excellent corrosion resistance. The powder coating process is similar to spray painting, but the "paint" is a dry powder instead of a liquid. The parts are first primed with an optional phosphating or chromating coat to increase their corrosion resistance, then coated with dry powder using an electrostatic "spray" gun and then cured in at high temperature (usually in an oven at 200oC). Multiple layers can be applied to create a thicker coating and the typical thickness varies from approximately 18 μm up to 72 μm. A wide range of colors is available. Use as machined finish for part with tight tolerances, where aesthetics are not an issue. Use bead blasting for parts with a matte uniform finish, when dimensional tolerances are not a key concern. Use anodizing (type II) to add a thin, aesthetically pleasing, protective layer to your aluminum and titanium parts. Use anodizing (type III) in engineering applications, where very high wear resistance and surface hardness are required. Use powder coating for applications were high impact strength is required or to finish parts that cannot be anodized.